"Rich with proven, practical knowledge and insights from highly successful women that you can put into action immediately to create your executive presence, be viewed as 'leadership material, ' and maximize your opportunities." --Nina McLemore, Founder and CEO, Nina McLemore, Inc.; founder and former President, Liz Claiborne Accessories; former member Executive Committee, Liz Claiborne, Inc.
"A fabulously insightful and powerful book for women who aspire to business leadership. Relying on decades of experience and research, the authors reveal key insights and successful strategies, including practical how-to advice, to enable women to hone and enhance their inherent leadership strengths. The book provides women with a compelling and straightforward blueprint for accelerated business success This is a must-read for women and for all mentors and coaches of women "
"Sharon Hadary and Laura Henderson have written a book that will be a blueprint for success that will inspire women in business for years to come--and not a moment too soon, given women's steadily expanding influence in business. 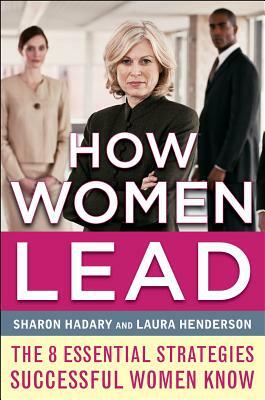 The authors have combined personal insight, research-based knowledge, and real-life lessons in a thought-provoking guide that will benefit women just beginning their leadership journey and women at the pinnacle of their professions. How Women Lead is a celebration of the perspective and power of successful women. This book belongs in every leader's personal library." IT'S A NEW WORLD FOR WOMEN IN BUSINESS LEADERSHIP.
. . . 6.3% of the top earners in the Fortune 500 companies are women? Women are moving into leadership roles in business, government, and the military, and they're gaining positions of increasing stature and higher salaries. BUT . . . women's upward movement is not matching the rate of their movement into professional and managerial positions. Written by two women's leadership experts who are themselves successful leaders, How Women Lead gives women the information they need to become high-potential leaders but don't get in business school: how to build a career on their own terms, gain the critical business management skills needed to advance, and advocate successfully for themselves. Whether you're already in the leadership pipeline, contemplating your next career move, or are working to empower women in business, the lessons of How Women Lead will show you the sky's the limit when you combine women's leadership strengths with sound business acumen.